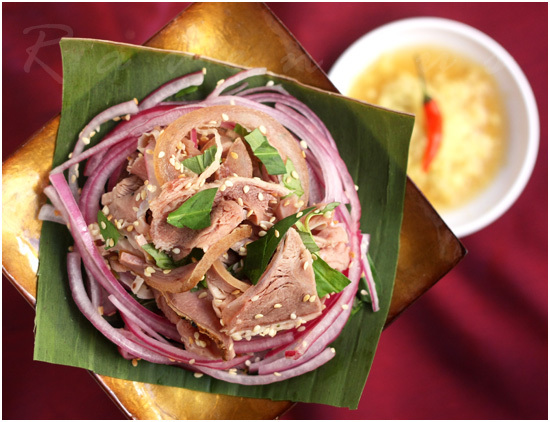 Be Thui (Vietnamese roast veal–pronounced tui) is a fantastic celebratory dish in Vietnam that is often served at Tet as well as other special celebrations. Unlike western style roast beef which uses different parts of the cow and roasted in an oven, Vietnamese be thui is a whole veal calf roasted over an open flame until the skin blackens (thui) but the meat inside is perfectly pink and tender. Some restaurants in Vietnam specializing in this delicacy may even have the roasting pit in the center of the restaurant. Compared with beef, veal meat is much more tender and delicate in flavor–and, there’s just something about roasting a whole veal in its own skin and bones that make Vietnamese be thui amazingly delicious. Growing up in Michigan, our family only had be thui several times since as you can imaging, sourcing a whole veal calf was be quite difficult. But during our recent trips to Houston, Texas we discovered a great source for be thui at Tan Binh Be Thui, a family run 4 acre farm raising veal calves for the main purpose of making traditional be thui–that is roasting the entire veal calf. It’s the best be thui we’ve ever tasted and better than the ones we can get here in California. The veal are free-raised, meaning they are free to roam and eat grass pasture not confined in corn feed lots or injected with hormones. This results in a very characteristic pink color to the meat and of course super taste and delicate texture. All the veal are all between 4-7 months and extremely lean. 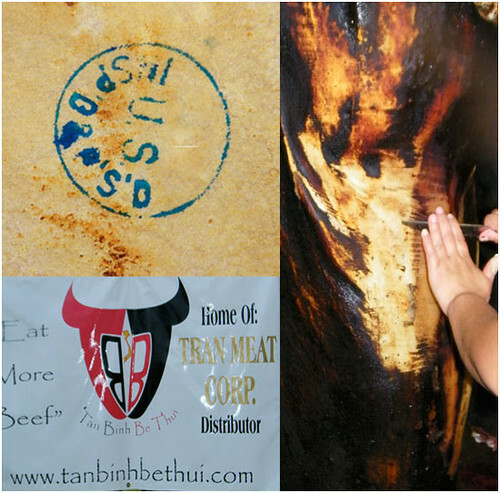 Husband and wife team of Chien and Barbara Tran are from two generations of ranchers originally from the city of Tan Binh in Vietnam and are proud to say that Tan Binh Be Thui is the only USDA approved be thui facility in the entire US. Here in California, we have no idea where the local market in Little Saigon get it’s be thui or how the calves are raised–we’ve asked but have gotten no clear answers. While no longer using the traditional roasting pit, Tan Binh Be Thui roasts the entire veal with a torch flame, searing the outside and cooking it perfectly on the inside. The blackened outer layer of skin is then scraped off and then the veal meat is sliced thinly and packaged. Tan Binh Be Thui currently ships their be thui all over the country wholesale to Asian markets but only recently began online shipments for smaller orders for individual consumers. Boy were we glad about that! For Christmas we ordered close to 30 lbs of be thui as gifts–half of that went to our family in Connecticut. The other half we used ourselves and gave as gifts. At 9.99/lb including free shipping for over 10 lbs it was a bargain for this hard to find delicacy. Having never ordered meats online, we were curious to see how it would turn out. The package arrived in a neatly packed styrofoam lined box and the frozen be thui was vacuum sealed in individual 1 lbs trays. Everything was still cold and ready to thaw and use. The other 15lb shipment to Connecticut also arrived in perfect condition as well and was promptly devoured by my family. Okay, so how do you prepare and eat the be thui? Glad you asked–it’s served like a meat salad at room temperature. There are some variations on how it’s prepared. One is with toasted sesame, chopped Vietnamese coriander (rau ram), and pickled onions. The other method is to substitute the sesame for ground roasted rice powder (thinh). Some people even use both. We prefer preparing it with sesame because the fragrance of toasted sesame really enhances the flavor of the veal, while we think the roasted rice powder is a bit too overpowering. Dipping sauces are also varied. We prefer a ginger dipping sauce over fermented soy bean sauce (tuong cu da). The be thui will arrive cooked and frozen so thaw in the refrigerator. In the meantime prepare the pickled onions. Combine sliced onions with vinegar, water, salt and sugar. Cover and place in fridge for about 20 minutes and then discard liquid. Once the be thui is thawed, gently squeeze out any excess liquid from the meat and place meat in mixing bowl. 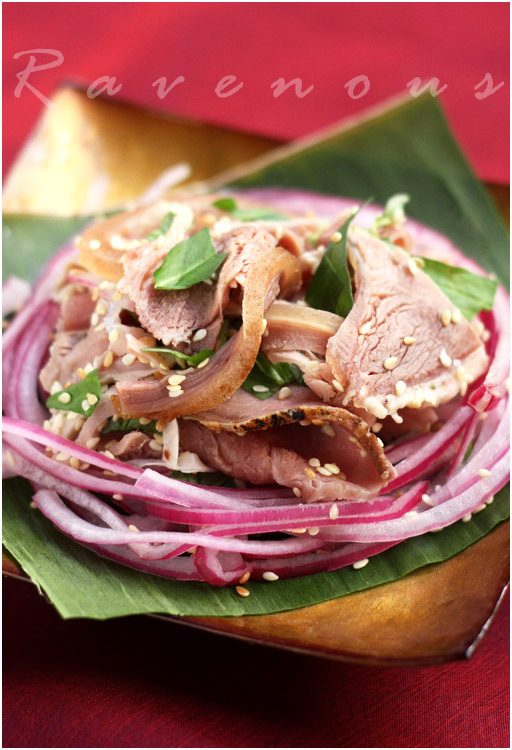 Combine the chopped coriander, sesame seeds, and pickled onions. Toss like a salad, transfer to serving platter and serve. Combine fish sauce, sugar and lime and mix until dissolved. Add minced ginger and optional thai chili. *Cooks note: Again, you can substitute the toasted sesame for roasted rice powder and dip with fermented soy sauce (tuong cu da) but we feel our version has cleaner flavors, letting the veal be the star. Be thui is so tender and the delicate flavor of the veal goes really well with the minty/spicy Vietnamese coriander and pickled onions and sesame. Enjoy with a cold beer or glass of red wine. It’s one delicacy that we used to crave but could never find in Vietnamese restaurants. Now we can have it delivered right to our door. We only have a few pounds left from our order and if kept frozen, the be thui is good for a whole year in the vacuum sealed packs. We’ll definitely be keeping be thui in stock as this delicacy is already cooked and takes no time to prepare other then time to thaw and pickle the onions. Disclaimer–we paid for all the products from Tan Binh Be Thui and received nothing for this post. You can order online from Tan Binh Be Thui or call in your order to 713-849-9596. Give be thui a try for your Tet celebration or your next party or family gathering, you won’t be disappointed! Oh, I can't take that roasting picture! Showing me the final beautiful dish, I don't mind tasting it though. tigerfish: the process is so unique, we had to post it…roast chicken vs. whole roasted veal…when does one see that? When I initially read the post I thought the process was a veal leg roasting over a spit fire. I was surprised when I scrolled down and found the entire calf smoking! The technique amazes me! I'm just imagining how succulent and smoky this meat must taste. Thanks for turning us onto Tan Binh Be Thui. I'll definitely be ordering some for a special occasion. FLB: Like you trying to source out the best food, this is our first time we're seeing the food at it's source, how it's raised and made. Poor little calf…..so roasted! But the dish looks great. Whoa! I had no idea how this dish was made. Who doesn't love blow-torched, free-range baby cow? First and foremost I have to congratulate you on your wonderful blog, photos are great and the content is always interesting. After reading about Be Thui I am definitely going to order some. However, I do have a few questions. Do you serve it as an appetizer or a main course? Can you suggest other dishes to serve with it? Stephanie: Thank you so much for reading our blog and taking the time to email! We love sharing what we know and do this because we want to learn about Vietnamese cuisine and culture so don't hesitate to ask. Typically it's an appetizer like a steak salad, something to share and munch on with beer or wine before a main course. It really doesn't go well with any rice or noodles, although the other day as we were eating this, we thought it would be an interesting idea to use this to roll up as spring rolls instead of pork or shrimp–but the unlike pork or shrimp this is quite the delicacy and great to showcase the veal on it's own. Very interesting how they cook that veal to perfection! Where can I get a torch like that, J/K. This looks fantastic, looks so tender and delicious. Good to know you can order the meat online. Blow torched goodness!! I always leave your blog hungry! First the steamer to make banh cuon from home now the free range steamer?You guys are truly a force not to reckon with. I swear I am coming to LA to hang out with you guys! i have never seen an actually picture of this being done. i remember when living in new orleans there were people that did this but it wasnt usda licensed or anything. but then again i never ate it. never been a red meat eater except for burgers. i know i am missing a lot but i just cant eat it. Be thui isn't available everywhere and it's nice that it can be ordered online. They do a really nice job in packaging it. That's why a gourmet kitchen is so important to us…Let us know when you'll be in LA next time! KungFu Panda: It certainly is an interesting way to cook goodness! That looks AMAZING! Wow, kudos for tracking down a unique operation. Now if only they could ship to France…Next time I am in Paris I will ask around to see where the restaurants get their be thui. Gorgeous presentation! You guys always make me crave Vietnamese food. I have yet to find my fix here in Manhattan. Dhale: Don't think we ever saw be thui in NYC…but it shouldn't be problem to get the be thui shipped. I'm so glad you posted this! I love this dish, and where I live there is no way of getting this (that I know of). Can't wait to order some. Thanks! You created a beautiful dish. Pretty as a flower! The meat looks perfectly cooked! I've seen anything charred like this before, interesting. 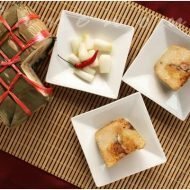 Christine: Many Vietnamese crave be thui throughout the US, but now you can or be thui online…isn't the internet great?? Ju: Thanks! 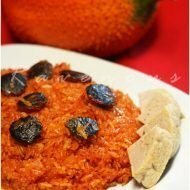 It's the Tet season, time to celebrate with some great be thui! Anne: The be thui, roast veal is so tender, it's amazing how they roast the entire calf. I've always stayed away from veal because of the practices used to raise them. So glad you guys found a place that employs free-range practices in raising veal. This was really interesting to learn about. Be Thui would not be appetizing to my (Hindu) husband, but it certainly was to (not Hindu) me. Amazing pictures! The dish looks so stylish!!! That's beyond gorgeous!!! OMG! It looks so good! I've never even heard about this dish. It sounds too good to miss. Have you guys ever put "thinh" in your be thui? I think the toasty, nutty flavor of the rice powder is great with torched veal. That's how I've always had it when I was younger, but the meat was a tad too rare for my taste, though still good. Yours look perfectly cooked. WizzytheStick: The process of making be thui is fascinating…sure we've seen whole roasted pigs..but a whole calf?? Gattina: Yea sometimes we tend to disassociate the meat from the animal..but yes, be thui is very tender! Chau: Yes, we have had be thui with thinh (as we mentioned above to substitute sesame for thinh if desired) we just like the cleaner flavors of the veal. some people use both in be thui. But yes, tan binh be thui does a great job of cooking it. you have a very nice shots of your pics. 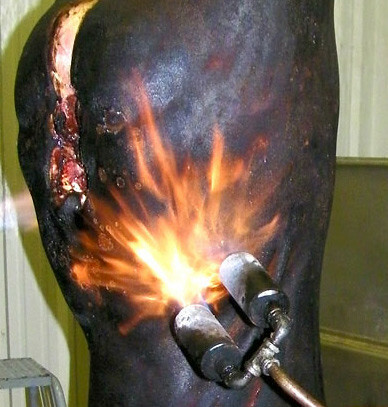 i was just shocked when i saw the veal roasted by a torch. the processing is so unique and very interesting. the roasting process is all worth it. Can I just say that I love your blog! My cousin and I just came back from Northern Vietnam and fell in love with the food there. I will definitely have to try some of your recipes. We've both been craving Vietnamese food but have steered clear of it just so it doesn't spoil our glorious experience in Vietnam. Thanks for reading my blog. How on earth did you find it? haha. 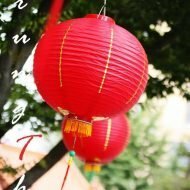 I am quite new to blogging, but I love that you found it. I came across your blog by accident and now I am glad that I have found this blog. Interesting recipes and with stunning pictures. I'll be visiting quite often. Thanks for sharing this recipe and looking forward to sharing more recipes. To tell you honestly, I came to love Vietnamese cuisine just recently.. and now Im craving Vietnamese all the time! I will definitely be back as I'm eager to learn how to cook VIETNAMESE! This is fantastic! Thanks for sharing, i have to ask my friends from Houston about this. skip to malou: Thanks for discovering us and hope you visit often! lv2eat: let us know if you try be thui down in houston! ChefE: yes, the flame torch technique is quite impressive! The way they cook the veal is pretty interesting. I just like it and I am really impressed. Hi!!! I really want to thank you for introducing this company to us!!! After reading your post today on Be Thui, you had me sold on these grass fed, free range veal. I immediately went to their website and ordered 8 pounds!!! 5 for my parents in Indiana, and 3 for me in Seattle. I hope this comes close to the Be Thui we have back in our hometown Hoi An. Thanks again! Note: Their promotion for free shipping of $50 order is over. The http://www.tanbinhbethui.com website is back up and running – call either number to place all orders online until the online store is launched again. Thank you!